It was a rare, cute glimpse of the couple's goofier side! Prince William and Catherine, Duchess of Cambridge, tend to keep things friendly but formal during their public appearances — but every now and then, they reveal their goofier side as a couple. Earlier this week, Prince William teased his wife about the color of her blazer during a visit to a Royal Air Force base in Cyprus. 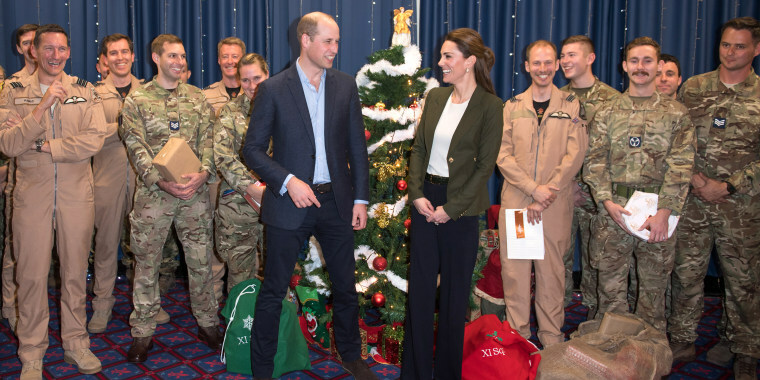 They were posing for a photo with military personnel around a Christmas tree, and the prince joked that his wife might be hard to see because of her olive-green blazer. “My wife’s camouflaged against the tree,” he said. It was a quick moment, and a cute reminder that Prince William and the duchess tease and joke like any other couple. The royal couple also shared a funny, candid moment back in October, when Prince William teased his wife about her art skills. But he made fun of himself too when he made his own brush stroke. “No, this is probably how you ruin a picture,” he said, as he and the duchess shared a big laugh. These moments of teasing aren’t often caught on camera, but it does seem like the royal couple are always cracking each other up. They’re often spotted giggling together, like in this cute photo snapped during the London Marathon last year. And they looked like they were sharing a laugh as they arrived at their recent Christmas party at Kensington Palace, which the duchess attended in a chic, festive tartan ensemble. It’s sweet to see the royal couple teasing and joking like any happy couple. What is love without laughter, right?